In the new wave of investments triggered by World War One, the focus of Japan's economic expectations shifted from the nation to the city, where the capitalist revolution's deepening impact was most dramatically felt. Sudden and rapid urban growth stretched the capabilities of city services and strained the seams of the built environment. The war boom propelled new groups to positions of social prominence, swelling the ranks of the new middle and working classes. Though prosperity proved evanescent, the possibility of gaining fabulous wealth in a short period of time was etched in popular memory as a feature of the urban economy, one dimension of the economic and social volatility of modern economic growth. The war years marked the eruption of a new level of crowd violence, on the factory floor and especially in the street, as rice riots broke out in cities throughout the country. Thus, World War One inscribed the image of the city with a new economic and social identity: one associated with an explosive pace of change, with instability, and with the specter of intensified social violence. Such visions of the city stood in contrast to older urban imaginaries. The feudal concept of the castle town, burnished over three centuries of political stability under Tokugawa rule, envisioned the city as a monument to the enduring power of the military elite. Tokugawa policies concentrated the ruling caste of samurai in the cities, where they constituted as much as 40 percent of the population. The remaining urban population of artisans and merchants supplied the needs and wants of the samurai. Organized as instruments of samurai rule, cities became seats of higher learning and administration, which Tokugawa law defined as the exclusive province of the samurai. With the overthrow of the Tokugawa regime, samurai dominance of the city ended and the myth of samurai permanence was shattered. In the urban reconstructions of the 1870s and 1880s a new vision emerged of the city as instrument of progress and modernity. Exemplified in the remaking of central Tokyo and the famous Ginza brick town, and in the new government buildings that shot up throughout the country, the urban reconstructions of the early Meiji period telegraphed a message to foreigners and Japanese alike about the city as symbol of Japan's capacity for civilization and enlightenment. And though this urban imaginary embraced a sense of managed progress and controlled change, it little prepared people for the tumultuous transformations of the First World War. Examining the different ways in which World War One catalyzed urban change, this chapter takes up the following questions: Why did a discourse on the modern emerge with such peculiar force in the wake of World War One? What touched off the extended reflection on the newness of everyday life? To understand the intensity and volume of this intellectual production, the pages that follow canvass the impact of the war years on the urban economy, the built environment of the city, and urban society to show why these issues began to register so dramatically in the consciousness of urban residents. Though of minimal significance for Japan militarily, World War One was the third of a series of wars that stimulated the formation of a modern industrial economy. Beginning with the Sino-Japanese War of 1894-95, and followed by the Russo-Japanese War of 1904-5, war booms shaped the contours of Japanese capitalism. Nascent factory production turned out armaments and ships to meet military demand and textiles bound for the East Asian markets that were captured in Japan's first colonial wars. When war broke out in Europe in 1914 the resulting disruptions in the global economy provided an opening for Japanese trade expansion, ushering in the third war boom in the space of twenty years. Although the initial impact of the war was to depress economic activity because of the rupture to international trade, by 1916 the opportunities opened up by the European war had touched off what amounted to a new phase in Japan's industrial revolution. The withdrawal of European textile and light industrial producers from colonial markets in Asia created a void into which Japanese manufacturers rapidly expanded. War cut them off from European sources of chemicals, machinery, and other heavy industrial products, stimulating the development of domestic production. European demand for armaments and other military goods further encouraged the growth of heavy industry. Japanese shippers were called on to handle this increased trade and Japanese yards to build the ships. All this generated a degree of economic expansion that surpassed the earlier war booms. Moreover, unlike during those earlier wars, military activity was limited to a bloodless occupation of German holdings in China and the Pacific, which meant that World War One was not associated with the deprivation and sacrifice that had attended the earlier periods of rapid growth. Far from it, this war boom brought with it a sense of sudden wealth, widespread prosperity, and conspicuous consumption. The war boom profoundly affected urban economies. While the late nineteenth-century wave of industrialization occurred mainly in and around the metropolises of Tokyo and Osaka and their affiliated ports of Yokohama and Kobe, the World War One boom left its mark on cities of all sizes. In terms of raw statistics, Tokyo and Osaka may have grown bigger and more quickly than the second-tier cities like the four in this book, but the impact of explosive economic growth on those smaller cites was just as intense. Fifty new companies were established in the city of Okayama between 1916 and 1920, and 99 in Sapporo between 1912 and 1920. Investments in Kanazawa's economy spurred leaps in production, pushing the value of manufacturing from 18 million yen in 1916 up to 50 million yen in 1920. Between 1912 and 1921, the value of heavy industrial production in Niigata rose by a factor of 11, from 2.5 million yen to 27.2 million yen. The speed of this expansion not only anchored the urban economy to manufacturing but also associated the modern city with dynamism and rapid economic growth. The surge in urban investment reflected a new confidence in the future of the city. Economic growth signaled a rise in the movement of goods in and out of the city. Though it expanded everywhere, trade grew most sharply in a port city like Niigata, where goods handled by the harbor rose from 13 million yen in 1912 to 30 million yen in 1921, more than doubling in ten years. Over the same period freight passing through the city's two principal train stations quadrupled, increasing from 10.5 million yen to 46.2 million yen. The growth in their economies integrated cities such as Niigata more closely into national and international markets and marked urban space more distinctly as a node within the modern trade nexus. That, in turn, implied the new power of urban economies to influence partners in trade and, with it, new vulnerabilities to the vicissitudes of the market. The growth of trade also raised the economic profile of cities, identifying them with their key exports and stamping them with the character of their productive base. Kanazawa thus became known as a city of crafts, producing hanabusae silk cloth, gold leaf, and lacquerware. With its oil refineries, Niigata was seen as a center for heavy industry. Okayama was a textile producer, and the beer that took the Sapporo trademark became the symbol of the city's ties to agriculture and the importance of its food processing industries. The nature of economic activity changed as well during the teens, stamping the urban economy with the imprimatur of modern factory production. One measure of this was the sharp growth in numbers of urban factories. In Okayama 11 new factories employing more than ten workers were established between 1912 and 1920; Sapporo had 52 factories in 1912 and 121 in 1920. Kanazawa's statistical yearbook recorded 190 factories with 6,141 employees in 1916 and 287 factories in 1919 with 8,556 employees. As an Okayama factory survey of 1921 showed, not only did World War One trigger a numerical rise in factories, it also impelled transformation of existing factory production, both in terms of scale (number of workers) and the shift to steam- and gas-powered mechanization. Even the growth of small factories (employing fewer than ten laborers) signaled a shift in the meaning of production, for the war boom generated a movement from household manufacture and the putting-out system to factory-based manufacture of goods such as furniture, lacquerware, tatami mats, umbrellas, and geta (traditional Japanese wooden clogs). For example, the number of factory workers producing lacquerware in Niigata rose from 129 in 1916 to 402 in 1918, a threefold increase. Within the space of a few years production of geta shifted from households concentrated in the neighborhood of Getamachi to factories. Such moves to the factory both altered the relationship of workers to production and changed the socioeconomic character of neighborhoods like Getamachi. To the political and economic elites who were privy to this knowledge, such statistics demonstrated the capacity of the urban economy to generate ever greater wealth, one more measure of the potential benefits of modern industry. The broader urban citizenry took much the same message from the evidence all around them of new ways to make and spend money. The transformations taking place before their eyes demonstrated to urban residents that cities were now characterized by rapid, even explosive, growth. Cities had become sites of industrial modernity, symbolized by the conversion to factory production and by factory mechanization. As a tendency to identify cities with their principal products revealed, this new urban imaginary foregrounded economic function: Japanese began to equate cities with their economic base. Wartime developments harnessed Japanese cities ever tighter to the engine of industrial expansion; their fate now hung on the future of the Japanese economy. In all these respects, the latest war boom altered the meaning of the city as an economic entity, and the possibilities for urban growth seemed boundless. Yet there was a dark side to the new urban dynamics. Even as statistics captured for the record unprecedented economic growth, these numbers did not always translate into improved livelihood for city residents. Perhaps even more than the expansion of urban economic activity, the movements in prices and wages during World War One demonstrated the new volatility of the urban economy, for it could both raise and lower urban living standards. While wage increases were widely welcomed by working-class urbanites, the price increases that soon followed were not. And though price increases improved profit margins of industrialists and merchants, they regarded wage hikes with alarm. Thus while inflation translated into a generalized sense of economic anxiety, the specific impact on prices and wages split workers and capitalists and served as one factor in the mounting tensions between new social groups. Although wage and price inflation had been a conspicuous feature of the earlier war booms, nothing prepared Japanese people for the increases of the late teens. Wages began to rise in 1915 and 1916 and then suddenly accelerated their upward trajectory until they peaked in 1920. The movement of commodity prices told a similar story. In 1918 newspapers everywhere reported the "violent rise" (bōtō) in prices, and they were filled with articles documenting the alarming increase in the cost of living. Okayama's San'yō shinpō reported a chamber of commerce survey of various shops in the city that compared basic food prices between 1914 and 1919; in an easy-to-read chart, the paper gave readers concrete numerical evidence on which to hang their feelings of alarm and outrage. Special-grade rice had more than doubled in price, table salt and cooking oil had tripled, and the fourteen other consumer staples included in the chart registered equivalent leaps in price. As bōtō became a catchphrase of the late teens, it underscored the dangers of rapid growth and the volatility inherent in the modern economy. Like prices of the late teens, the expanding urban economy could quickly spin out of control. While the explosive growth of World War One altered the economic meaning of the city, the physical transformation of urban sites over this same period changed the significance of the city in other ways. The rapid expansion of production, the rapid influx of population, and the rapid increase in the circulation of goods and people all placed pressing new demands on urban infrastructure, setting off a frenzy of construction that identified the city as a site of speed and ephemerality. Electric power, introduced in the late 1880s, became exponentially more widespread in the teens, illuminating the streets, electrifying middle- and upper-class households, and transforming factory production. In Sapporo, for example, there were 255 streetlights in 1911; by 1920 the number had risen to 7,835. Over the same period households that were supplied with electricity increased from 2,695 to 21,075, and factory consumption leapt from four thousand to over 4 million kilowatt hours. While in previous decades, the gaslight and the spindle served as symbols of civilization and enlightenment, they were being replaced by a modernity of the neon sign and electrical appliance. Like many cities, Kanazawa laid a streetcar line in the teens. Before it opened to great fanfare in early 1919, the streetcar necessitated an extensive reshaping of the city along the path of the rail line, the razing of scores of stores and residences, and the destruction of neighborhoods in order to widen the road to accommodate the streetcars. A vibrant new commercial and entertainment strip sprang up on the foundation of old neighborhoods along the tracks, creating what would become the heart of "modern Kanazawa." In Niigata, the municipal government had carried out wharf construction and port improvements continuously since 1907, dredging the Shinano River, improving the banks, building a breakwater, and erecting a lighthouse. When Niigata annexed Nuttari, its sister city on the opposite bank of the Shinano River, the two communities commenced construction on an elaborate new wharf to expand Niigata's port facilities. At the same time, the city began an ambitious landfill project on the east side of the river, creating tracts of worker housing next to the industrial zone that was taking shape along the riverbank. The dredging, the riparian works, and the landfill dramatically reshaped the river and altered its course. In the space of a few years the river-which had been the economic and social center of these two port cities for generations-was utterly transformed. In Okayama, where a river also ran through the heart of the city, municipal government began to reconstruct the main Kyōbashi Bridge in 1915. After two years of work the old wooden structure was replaced with a reinforced concrete construction. Like the lighting of Sapporo's streetlamps the inaugural run of Kanazawa's streetcar, or the ceremony marking the completion of Niigata's wharf, the opening of Okayama's new bridge was a moment of great civic pride. A photograph of the ceremony published March 25, 1917, shows the bridge thronged with people as they surged up from the embankments to step onto the bridge the San'yō shinpō proudly hailed as the "first reinforced concrete bridge in the prefecture." In these ways, the pressures of the war years spurred municipalities to expand the range of urban amenities and develop basic infrastructure to accommodate the demands of a surging population and burgeoning local industry. As new electrical and telephone services became available, as cities created systems of mass transportation, as they widened and paved their roads, and as they improved sewer systems and expanded the supply of running water, the built environment of the city seemed to become a perpetual motion machine, the streetscape a site of ceaseless change. In the process, the modern city came to be identified with both the sheer, dizzying pace of change and the endless quest for technological improvement. Modernity signified the replacement of gas with electricity, of wood with concrete, of single stories with double, and double with triple. It meant roads became ever wider and rivers ever straighter. Destined for endless remaking, the modern city could never be finished. Such notions of the city anticipated the epistemological shift in urban thought that took place in the wake of the great Tokyo earthquake of 1923. In a matter of hours the quake and the fires that followed destroyed vast sections of the Japanese capital. As a new, modern Tokyo arose atop the rubble of the old city, the earthquake became etched in popular memory as a watershed moment: the birth of a Japanese modern. The dramatic reconstitution of Tokyo's built environment seemed to evacuate the capital of its past. But before the operatic scale of the earthquake turned all eyes toward Tokyo, the more modest dramas of the wartime construction booms brought urban residents throughout the country face to face with new meanings of the city. Though it was only after the earthquake that theorists of the modern such as Kon Wajirō and Gonda Yasunosuke began to connect the emergence of the new physical space of Tokyo with the possibility of creating a new urban culture called modanizumu (modernism), the groundwork for these ruminations was laid in the multifarious construction booms that took place in Japan's smaller cities during the war years. Even as the construction boom coupled the concept of continuous change with the image of the modern city, the demonstrable failure of municipal infrastructural improvements to keep pace with explosive growth made it clear to municipal authorities, if not to urban residents, that there was no easy solution to the crisis of infrastructure. Like perpetual change, the ongoing crisis of infrastructure appeared to all to be a piece of the modern urban condition. In Okayama, just before the war broke out, the municipal authorities undertook a large improvement in the urban waterworks. Anticipating a population influx with the establishment of a local army division in the city, they planned to expand the water supply to accommodate the new residents. But the sudden urban growth spurred by the war boom threw this careful planning out the window. The rapid expansion of city industry caused water use to rise an unprecedented 27 percent per year. Even as the project was nearing completion, it became clear that increasing demand would strain the capacity of the new waterworks. The staggering pace of growth took the city completely by surprise. In a similar vein, efforts of local authorities to improve and expand networks of roads in order to facilitate the flow of goods and people through the city met with a new and unexpected challenge: traffic. For Japan, World War One marked the advent of the automobile, which quickly became a major contributor to traffic congestion and bedlam in the streets. Initially fleets of cars were operated by transportation companies, which employed them to deliver goods to locations not served by the train. Taxi and bus companies soon followed, and the numbers of automobiles on the city streets increased. As a 1920 article in Okayama's San'yō shinpō observed, "Although automobiles were a rarity three or four years ago, recently there has been a surprising and dramatic rise in the numbers of cars on the road." By contemporary standards, local car ownership was quite modest. Okayama prefecture's first car was purchased in 1912, and only 130 automobiles were registered by 1920; these operated almost exclusively in the capital and a few other cities. Statistics for Ishikawa prefecture and its capital city of Kanazawa were similar: the first car was bought in 1913 and only 130 were registered prefecture-wide by 1921, a year when eight different companies operated fleets of automobiles in the capital. The problem was not so much the numbers of cars but the hazard a fast-moving, large-bodied vehicle constituted for the narrow and winding road networks that were the inheritance of Japan's feudal cities. What with bicycles, jinrickshas, horse- and ox-drawn carts, and streetcars all sharing the roads with automobiles, "traffic" was beginning to register among the growing host of urban social problems. Although Kanazawa had leveled large sections of the downtown to create the new arterial road system that led through the city center, traffic surveys conducted barely a few years after road construction was completed revealed a new crisis at hand. A survey in April 1921 measuring the amount of traffic that traversed a level crossing near Kanazawa station showed that in a single day, on average, 5,976 pedestrians, 234 bicycles, 703 wagons, 49 carriages, and 5 automobiles made the crossing. This meant that trains were forced to wait at the crossing for a total of four and a half hours a day. As a local newspaper reported, the results of its own survey several years later showed that the deplorable degree of traffic congestion forced Kanazawa residents to move about "like rats trapped in a bag," and the situation cried out for government intervention. All this suggested that urban growth had accelerated out of control. City boosters who earlier had observed with great satisfaction the leaps in productivity and the mushrooming of new factories now began to sound an ominous note. Their beloved city was rampantly expanding in unpredictable ways, creating an endless series of crises, a daily onslaught of demands for new services that the existing apparatus of municipal government seemed ill equipped to meet. Indeed, the stresses of the wartime construction boom, much like the "violent rise" in prices that overtook the latter years of industrial expansion, convinced urban elites of the need for a stronger hand at the helm. 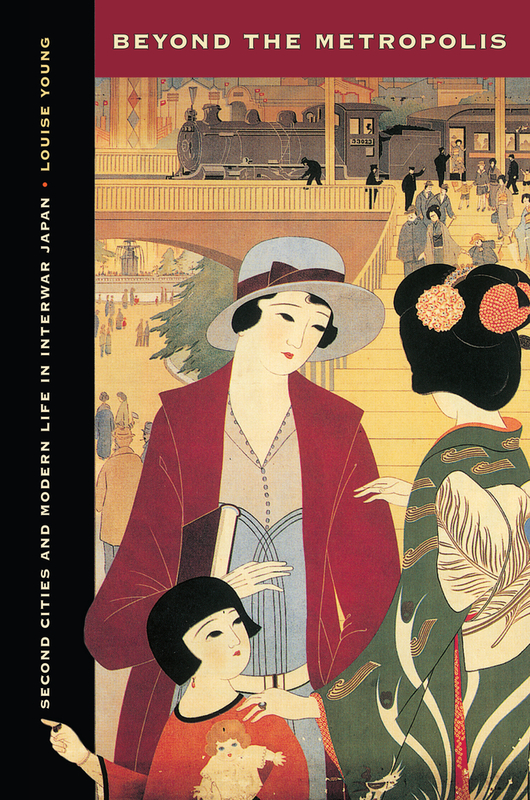 As Japan's cities headed into the third decade of the twentieth century, the experience of the war boom demonstrated both the fantastic possibilities for economic growth and the need to bring some measure of control over its direction. The war boom convinced people that growth was good, but not violent, chaotic growth, and this conviction helped fortify public support for a dramatic expansion in the municipal state. In these ways the experience of World War One laid the foundation for the era of city planning and municipal social engineering and stimulated a rethinking of the city idea. The economic volatility and dramatic physical transformation of these years were mirrored in the domain of urban society. More than anything else, the figure of the narikin, or nouveau riche, came to symbolize the social effects of the war boom. Taken from a Japanese chess move that aggrandized a pawn into a more powerful piece, the term was applied after the Russo-Japanese War to a handful of speculators like Suzuki Kyūgorō, who got rich quick playing the stock market. After his sudden acquisition of wealth catapulted Suzuki into a position of social prominence, he remained in the public spotlight by frittering away his earnings in a life of ostentatious dissipation. Men like Suzuki became symbols of rogue capitalism, speculators who operated on the boundaries of legitimacy and whose relentless pursuit of profits caused panics and otherwise endangered the economy. The narikin were enhanced by the aura of the stock market, and their reputation was inseparable from popular images of this new capitalist institution. Established in the late nineteenth century, the securities market became an important avenue of business finance; however, the primacy of government-controlled banks, and of the house banks of the big-business organizations known as zaibatsu, meant that it would always remain a less reputable and less secure means of industrial finance. Moreover, while government policies that promoted private industry smiled upon upright businessmen such as the founders of factories, stock traders were regarded with some suspicion-the dark twin of the good capitalist who strove to grow the economy in the name of building Japan's wealth and power. As the economic boom of World War One expanded entrepreneurial opportunities, the number of parvenu capitalists multiplied and the narikin dominated the ranks of businessmen in all fields of activity. No longer considered economic adventurers and associated with the shady economic underworld of the stock market, the narikin entered the mainstream of economic activity and became the symbol of the go-go economy and urban prosperity. Yamamoto Isaburō of Okayama was a case in point. A local shipping magnate who made his fortune during the war, Yamamoto became a celebrity both for his eccentric and flamboyant habits and for his public munificence. In attracting notoriety, Yamamoto represented a complicated symbol of the modern economy. His meteoric rise into the plutocratic ether was made possible by speculative investments during the war boom, but it also followed a lifetime's diligent pursuit of self-improvement, in which he had followed the sanctioned road to upward mobility via hard work, education, and duty to company. Born into modest circumstances, Yamamoto spent his childhood laboring in a tofu store to augment the family income. Although poverty precluded him from regular attendance at elementary school, he subsequently found the wherewithal to matriculate at middle school, to gain admittance to the elite Dōshisha University in Kyoto, and from there, to move on to and graduate from Sapporo Agricultural College. He used his university contacts to good effect, involving himself in land development and agribusiness in Hokkaido, then using his connection with former teacher Nitobe Inazo to secure a post in a Tokyo trading company. After Yamamoto strove to establish himself within the ranks of senior management, a lucky break left him in a position to take over the firm when the president suddenly died in the early 1910s. The timing could not have been better: on the eve of the First World War, Yamamoto found himself well placed to take aggressive advantage of opportunities in the East Asian trade; by the late teens he had ridden the war boom to amass a reputed fortune of 40 million yen. Thus, through good fortune and hard work, the humble tofu boy had bootstrapped his way to a position of wealth and social influence. Self-made men like Yamamoto united the good capitalist and his more dangerous twin in the new figure of the narikin, who was redefining the face of the urban economy. Yamamoto's rags-to-riches story modified the existing narrative of the narikin in other ways as well. Like other wartime parvenus, Yamamoto achieved notoriety both for his good deeds and his outrageous behavior. His most prominent act as public benefactor was a donation of eighteen thousand yen for a public library, built in 1917 and boasting sixty-three thousand volumes. Yamamoto housed his new library in modern architectural splendor, presenting Okayama city with one of its first two-story buildings constructed with reinforced concrete. He demonstrated his public munificence in other ways as well, financing a local newspaper and establishing the Yamamoto Agricultural School in Kume County, where he was born. Probably more than his good deeds, however, Yamamoto's ostentatious lifestyle made him the stuff of urban legend. He earned the sobriquet "tiger magnate" (tora daijin) after he led two hundred men on a much photographed tiger hunt in Korea. He enhanced his reputation for extravagant amusement when he staged a sensational contest between Tokyo and Kyoto geisha. Reserving an entire train traveling from Tokyo to Kyoto for a party of friends and a company of Tokyo geisha, he followed these onboard festivities with a lavish party in Kyoto, where the local geisha had their turn to entertain. During the war boom such stories of the eccentricities of overnight millionaires-their excessive generosity and their excessive extravagance-turned the narikin into local legends. Standing out from the ranks of the ordinary businessman-the bland and timorous salaryman-the narikin exuded brazen self-confidence and hypermasculinity.Symbols of an age of excess, the narikin were larger than life, social abnormalities that defined the new social extremes that the modern economy could produce. Though stories about shipping magnates such as Yamamoto fed the stereotype of the narikin, the term also applied to other beneficiaries of the new urban prosperity. In a city like Kobe, where the local economy was anchored to shipbuilding, the demand for ships brought a wave of prosperity that lifted the fortunes of many local residents. As one observer noted in 1918: "In Kobe the capitalists, the ship owners, and the laborers have all become narikin. To put it another way, Kobe itself has become a narikin." Others commented on the extraordinary wage hikes commanded by skilled labor, especially those working in munitions factories. Workers were said to "disport themselves like narikin, hiring prostitutes, some of them even commuting back and forth to work from the red light district. Workers are welcomed in the cafés and restaurants like the god of wealth." In Sapporo, the surging demand for agricultural exports brought prosperity not only to shipping interests but also to farm supply firms and local transport companies and to food processing, marketing, and warehousing operations. Locally, the lexicon of the nouveau riche expanded beyond mere "shipping magnates" (funa narikin) to include the "starch millionaires" (denpun narikin), who owned potato-processing companies, as well as the "giant radish"(daikon), "pumpkin" (kabocha), and "pig" (buta) narikin who were bringing new custom to Sapporo's shopping districts as they accompanied their families to town to spend their newfound wealth. As such commentary revealed, the narikin had come to embody the social possibilities raised by the modern economy, as well as to symbolize rapid growth and urban prosperity. Ultimately the figure of the narikin proved a disquieting image, for the fortunes of the narikin, like the urban economy itself, fell as dramatically and rapidly as they had risen. If the narrative of the narikin that took form in the war boom began with social obscurity, it ended in financial calamity. Yamamoto Isaburō was no exception: he lost his entire fortune in the catastrophic postwar depression that set in after 1920, when European traders returned to reclaim their markets and demand for Japanese shipping dried up. The cascade of bankruptcies among the narikin demonstrated that, while growth in the modern economy generated unprecedented prosperity, it also brought unprecedented insecurity, a lesson reinforced by the swelling ranks of the unemployed that became a symbol of the postwar bust. But even as their fortunes fell, the fate of the narikin advertised the mixed blessings of the modern economy, for along with memories of the volatility and risk, the uncertainty and insecurity, narikin left behind permanent monuments to their fame and munificence. The libraries and the schools, no less than the tales of wild parties and tiger hunts, spoke to the social possibilities of urban capitalism, nurturing hopes for a return to prosperity and stoking dreams of instant wealth and conspicuous consumption. Even more than the oversized figure of the narikin, the rise of worker radicalism and urban protest in the late teens signaled the dangers inherent in the new urban economy. World War One marked the onset of a new level of urban violence, as the eruption of popular rage in the rice riots of the summer of 1918 underscored the instability of urban society. And just as the accelerated urbanization of these years generated new meanings of the city in terms of physical space and economic function, the rice riots heightened fears that modern urban society was violently unpredictable and constituted a serious threat to political order. Volatile rice prices provided the trigger for the riots that engulfed the country in the hot summer of 1918. An unfortunate conjunction of circumstances propelled the cost of rice in a dangerous upward spiral. The sudden growth of the urban population had led to a rise in demand for rice as a staple of the daily diet and as an ingredient in the manufacture of sake and other rice-based products. At the same time, migration to the cities produced a labor shortage in the countryside, causing a fall in the supply of rice. The situation was exacerbated by rumors of an imminent military expedition to Siberia, which was then officially announced on August 2. Anticipating a redirection of a large segment of the rice supply to feed the troops, the news spurred grain speculators into action. It also encouraged widespread stockpiling, competition between regional markets for a dwindling supply, and rice prices that varied wildly from place to place-all driving the vicious cycle of inflation ever faster. As rice prices rose, the economy continued to boom, and some were clearly enjoying the benefits of prosperity. But while narikin engaged in orgies of conspicuous consumption, others found themselves unable to afford even a family meal. In some areas no rice was to be had for any price. Rumors abounded that merchants were hoarding supplies or shipping rice out of the district in search of greater profits. In desperation and rage, urban crowds blamed rice merchants for their greed and the government for its failure to rectify the situation. The rice riots began in July as a "housewives revolt" (nyobō ikki) in a small Toyama fishing village, when fisherwomen refused to allow local rice to be loaded on ships for transport to urban markets in the Kansai region. Protests spread quickly along the Toyama coast and into urban centers throughout Japan. By mid-August the entire country was engulfed with rioting, which affected 38 cities, 153 towns, and 177 villages and involved an estimated six hundred thousand to a million participants. Though the riots were touched off in a village, when transferred to an urban setting they took on a more frightening aspect, becoming associated with a dangerous new form of crowd violence. Michael Lewis points out that the urban riots went beyond the rural protests in their sweeping indictment of the political status quo, representing a "massive rejection of the new Japan by great numbers of its citizens." The distinction made between the rural and urban riots was reflected in the words used to describe them. While the media spoke of village ikki, employing language derived from the feudal lexicon of peasant uprisings, they referred to urban riots as sōjō-a term drawn from the Meiji criminal code, which categorized sōjō as a crime of sedition. The riots drew on a history of urban militancy that had gathered strength since the Russo-Japanese War of 1904-5, and which had schooled the urban crowd in political tactics empowering the disenfranchised. Since the shocking Hibiya Riots of 1905, where unruly crowds overran Hibiya Park to protest the terms of the peace treaty with Russia, urban rioting had become an increasingly familiar feature of urban politics. Over the years, urban residents learned to use shimin taikai, or "citizens rallies," as a means of protesting streetcar-rate hikes, new taxes, and other offensive aspects of municipal policy. If the authorities refused to give way, the crowd frequently demonstrated its displeasure through violence, attacking symbols of the political order such as police boxes and government offices. At the same time, the formation of labor unions created another vehicle for collective action that provided a source of social power for the disenfranchised. The labor shortage of the war boom gave workers a new advantage over their employers, an edge that labor activists were quick to seize in their quest to improve working conditions. The war spurred union organizing and emboldened labor activists to use strikes and other forms of militancy to press their demands. Though both these forms of crowd militancy had created a new source of social power to express political demands, nothing prepared political elites for the extent and force of the rice riots. The nationwide riots pushed the government to extreme measures, forcing it to impose a media blackout and to dispatch troops to 144 locations to put down the disturbances. The aftermath was equally dramatic: for failing to prevent the riots, the Terauchi Masatake cabinet fell in disgrace, signaling the ability of the disenfranchised crowd to determine the fate of the prime minister. The crowd forced a host of new policies concerning rice prices and rice supply, as well as new measures to address poverty and provide social services for the urban poor. Most of all, the riots burned into popular memory the image of a chain of cities engulfed in rioting: the specter of urban revolution. The media were a key factor in the outbreak and spread of the rioting. Indeed, their role in the rice riots served as an important demonstration of the social power of the press among an increasingly literate, newspaper-reading public. Coverage in the press of the daily rises in rice prices helped inflame public anger in the first place; sensational reports of riots in one locale inspired crowds elsewhere to act. Moreover, the press served as a kind of advertisement for local rallies and other crowd actions, as in Niigata, where the Niigata shinbun published the contents of leaflets that called on local residents to gather and discuss the situation. Extensive coverage of an August 12 rally in Kanazawa that erupted into a riot merely brought greater numbers out the following night, when the crowd regrouped at the same public park to renew its demands. Recognizing the inflammatory role of the media, in mid-August the Home Ministry began to censor reports of the riots. Coverage in the press helped shape public perceptions of the angry crowds and constructed narratives of their actions. Even in cities like Sapporo, where despite the circulation of advertisements for a "citizen's rally to discuss the problem of rice" neither rallies nor riots occurred, articles on rioting elsewhere impressed local residents with the power of the urban crowd. The story told in the newspapers concluded, significantly, with the suppression of the riots and the arrest of the perpetrators, but not before treating the public to hair-raising accounts of crowds of thousands surging down the streets, overwhelming the local police forces, and venting their rage on the political and economic elite they blamed for their troubles by throwing rocks, lighting fires, and smashing houses. Newspaper accounts of the Kanazawa riots detailed crowds of several thousand gathering on the evenings of August 12 and 13, the first night on the grounds of a local temple, the second at the city's major park. As the paper told the story, on the first evening of rioting, after the crowds had gathered at the temple grounds, they broke into four groups and spread out over the city, stopping in front of residences of rice merchants, wealthy landlords, and political authorities. At each stop they issued a summons to the master of the house to come out and negotiate with the crowd; they demanded provision of cheap rice to the residents of the city. If their call was answered and demands were met, the crowd moved on. But if the gate remained tightly shut, they vented their rage by breaking down the door and smashing up the entry hall. The local press in Niigata and Okayama told similar stories of escalating violence. In mid-August the Niigata shinbun reported that crowds that had gathered in Hakusan Park for Obon festival dancing were roused to action by a series of impromptu speakers denouncing local merchants for their refusal to lower prices. A pack of angry people surged out of the park and headed for the home of Kagitomi Sansaku, where sentiments toward the powerful rice dealer were expressed with a hail of rocks. Likewise, the San'yō shinpō reported the outbreak of violence at the Okayama rice exchange, where two brokers were assaulted by an irate mob. Though city authorities tried to avert rioting by dispensing reduced-price rice, an angry crowd gathered at the storefront of a leading rice merchant and, judging the company efforts wanting, broke into the warehouse and distributed rice to those waiting in the street. From there they headed for the residences of the company president and other local merchants, smashing houses of businessmen rumored to have profited from the rice inflation. Though the police were present for most of this, they were overwhelmed by the sheer numbers of the rioters and could only stand by ineffectually. In Okayama, crowd violence was quelled only with the arrival of the local army regiment. Such tales of urban rioting conveyed in lurid detail modern society's frightening capacity for violence. In the way the press framed their stories, they drove home several points about the significance of the rice riots. The first concerned the appropriation of city space by the crowd. Gathering at parks, temple grounds, and other public spaces inscribed them as sites of popular political revolt, memorializing and monumentalizing the social power of the crowd and creating an alternative to the town hall as the symbol of grassroots democracy. Second, newspapers told the story of the righteous anger of the crowd that arose from its frustration with the inability of local political authorities to resolve a crisis situation. Though the crowd's methods may have been extreme and alarming, the press tended to portray the cause of the rioters as just. The third message conveyed by the newspaper coverage of the rioting concerned the rioters' political significance. Unable to get results through established political channels, the crowd took matters into its own hands, entering into direct negotiations with local businessmen to seek relief from starvation. In this way the crowd had created its own form of political action and its own rules of political ethics. This signaled the growing power of the disenfranchised to express their will through extraparliamentary means and rendered the town hall momentarily irrelevant. Finally, the photographs of battered houses and smashed up warehouses telegraphed to urban elites the message that they ignored the demands of the lower classes at their own peril. If not met with a good-faith effort, the crowd was capable of exacting a high price on the wealthiest and most powerful members of the community. The local police force offered no guarantee of safety. The denouement to the drama of the rice riots came in the fall of 1918, when the newspapers reported the results of police investigations and the outcome of the trials of those arrested. Here the central focus of the press was the social background of the rioters, highlighting the principal role played by the urban working poor. Although historians such as Michael Lewis have stressed the socially heterogeneous composition of the crowd, journalists at the time judged participants to be "poor" (saimin) or "the lower classes" (kasō shakai). Later reports reinforced such impressions. In Kanazawa, five of the seven arrested were foil workers-a category of craftsmen who pounded gold and silver foil for inlay in religious accouterments, lacquerware, and other traditional craft products. Since Kanazawa was a center of the foil industry, foil workers comprised a large percentage of local craftspeople that, together with day laborers, small tradesmen, and workers in small factories, were among the poorest paid of urban workers and most vulnerable to rice price inflation. The other two arrested were a secondhand goods merchant and a day laborer. In Okayama, where a much higher number of arrests reflected the greater scale and violence of local protests, 177 were eventually prosecuted in connection with the riots. Of these, 53 were unskilled "coolie" and day laborers, 35 were craftsmen, and 36 were small tradesmen. Striking in their absence from the list were workers from Okayama's abundant textile factories, reinforcing the impression that the rioters came not from the better-paid aristocracy of large-factory labor but from the underclass of working poor. Moreover, with headlines like "Peremptory Demands of Poor Burakumin Terrorize Rice Merchants" (August 20) and "Armed with Bamboo Spears, Burakumin Riot Attacks the Wealthy" (August 22), San'yō shinpō reports underscored the dominant presence of the former outcasts known as burakumin among the protesters, further strengthening the image of a crowd composed of marginal peoples-the poorest of the poor, the most socially debased, and the most economically disadvantaged. These marginal elements of urban society suffered the most from the volatility of the modern urban economy, and their sense of disaffection could be dangerously transformed into violent rage. Images of new forms of urban wealth and poverty that circulated during the war boom suggested that if narikin were the beneficiaries of economic growth, these were its victims. Occupying the extremities of the new social unevenness produced by urban capitalism, the violent gestures of the crowd, no less than the conspicuous consumption of the narikin, dramatized the new social face of the city. The economic boom of World War One left its mark on Japanese cities of all sizes and identified urban space as one of capitalism's new frontiers. Urban growth transformed both material realities of urban life and the way people thought about urban economy and society. The city emerged as a powerful symbol of the modern economy, illustrating the hopes and fears of what industrial growth might promise for the future. The ongoing construction boom appeared to bear out the modernist dictum of creative destruction and destructive creation. In the dizzying pace of change, urban development followed the emerging imperative to clear out the old and make way for the new. Amid the social upheaval triggered by the disruptions of the war years, the twin symbols of the narikin and the urban crowd seemed to distill the social possibilities offered by urban growth. Unprecedented wealth and unprecedented poverty, the potential for a paradise of riches as well as for insurrection and revolution-the possibilities made visible by the war years inspired a host of utopian and distopian meditations on modernity in the years that followed. If the war years taught people that change could come quickly, without warning, and with awesome force, they also raised the potential of harnessing and directing this power to control the future. In these ways the tumultuous experience of World War One contributed to the emergence of a new social imaginary that refigured the city as a social, economic, and cultural space. As we shall see, the war prompted an extended historical moment of intensive reflection on the significance of recent change and gave rise to a new social consciousness of the modern. This social imaginary situated cities at the center of modern life and at the vanguard of national progress, leaving behind the social world of the countryside. Uneven development gave rise to new economic and cultural geographies that concentrated wealth and power in cities and subordinated the provinces to the metropolis. Cities became sites of a distinctive temporality, where time sped along and the minutes ticked by faster. Contemplating the dynamism of the interwar years, urban elites determined that cities represented the point where the forces driving modernization seemed to converge in both space and time. These changes cumulatively defined an identity for the city that was grounded in the conceptual fusing of modernity with the urban form. Although the identification of the city with modernity appears to be common sense today, the conviction that "city = modern" is in fact a historical product. To retrace the genesis of this belief, in the pages that follow I ask the question How did the city become the center of modern economic and social life? One answer can be found by examining the forces that made Tokyo into a "world city" and center of the Japanese empire while simultaneously producing new lines of division between "city" and "country." The first part of this book, to which we now turn, tracks the development of the cultural and economic geographies that defined the social space of "modernity" through the creation of a new system of centers and peripheries. Louise Young is Professor of History at the University of Wisconsin-Madison and author of Japan’s Total Empire: Manchuria and the Culture of Wartime Imperialism (UC Press, 1998).